Iconographic Features: Horrible Bird with trophy head and cap (?) in its beak. Iconographic Features: Horrible Bird with cap (?) in its beak. Iconographic Features: Horrible Bird with Feline Serpent in its beak. Closed eyes of Feline Serpent indicate death. Description: ceramic cup bowl, Nasca Valley, C-11931, M.N.A.A.H.-Lima. Iconographic Features: Feline Face with four hands coming out of two sleeves. It is depicted in frontal view holding a club (left side). Extended tongue terminates in a feline head. Jagged chamber-like extrusions contain processions of men who are holding beakers. Beneath five men with beakers are portrayed surrounding a two large vessel (with corn beer (chicha)?). Beneath the sleeves of the main figure four men holding beakers appear. 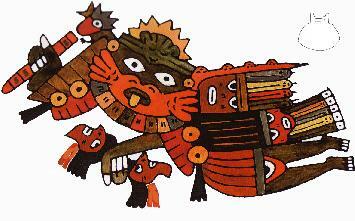 Description: ritual vessel, redrawn after Zarate 1982, colored by Clados. Iconographic Features: Feline Hawk grasping the hair of a warrior with both hands. Warrior is holding a club. Feline Hawk is depicted in bird’s-eye view Beside the Horrible Bird Feline Hawk belongs to the most important bird creatures in Nasca iconography. Iconographic Features: Bird Mythical Being 4 (BMB-4) depicted with wing, snake body with tail, human torso with legs, and human arms. Wing and tail depicted with snake feathers. Human body dressed with tunic and skirt. The main figure is grasping the hair of a warrior holding a sling. Description: collared jar, C-64076, M.N.A.A.H.-Lima. Iconographic Features: Horrible Bird depicted with Feline Serpent in its beak. Harvester marked by hunger (HV-1) appear on the left side. He holds a jícima fruit. One of a few paintings that show the Horrible Bird and Harvester side by side. Description: ceramic, double spout bottle, ID number missing, The Art Institute of Chicago. Iconographic Features: Bird Mythical Being 4 (BMB-4) depicted with wing, avian body with tail, human torso with legs, and human arms. Wing and tail covered with trophy head and depicted with snake feathers. Human body dressed with striped tunic. The main figure holds a club and two trophy heads. Depicted by using the convention of Animal Emblem Format. Description: ceramic cup bowl, C-13152, M.N.A.A.H.-Lima. Iconographic Features: Bird Mythical Being 8 (BMB-8) depicted in bird’s-eye view and with trophy head in its beak. Wings and tail are covered by trophy heads. Feathers replaced by snakes. Anatomy looks compressed. Description: ceramic cup bowl, C-13153, M.N.A.A.H.-Lima. Iconographic Features: Bird Mythical Being 8 (BMB-8) depicted in bird’s-eye view and with trophy head in its beak. Wings and tail are covered by trophy heads. Feathers replaced by snakes. Outstretched legs might be human. Anatomy looks compressed. Iconographic Features: Feline Hawk holding trophy head with both hands. It is depicted in bird’s-eye view. 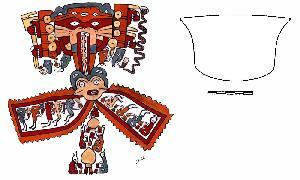 Description: effigy vessel, redrawn after Donnan 1993, colored by Clados, M.N.A.A.H.-Lima. Iconographic Features: (Seated?) 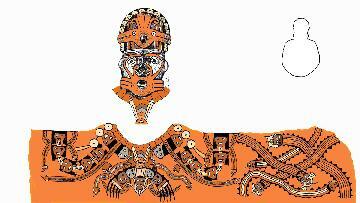 Anthropomorphic Mythical Being wearing headdress, mouth mask and a necklace made of (spondylus?) shell. Both hands move toward Feline Hawk (see CL 58, 60) who appears in the mid, and probably tries to catch him. Feline Hawk is depicted in bird’s-eye view. Trophy heads attached to a carrying cord appear on both sides. 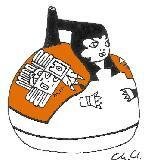 Description: effigy vessel, redrawn after Donnan 1993, colored by Clados. Iconographic Features: Bird Mythical Being 4 (BMB-4) depicted with wing, tail, human torso with legs, and human arms. 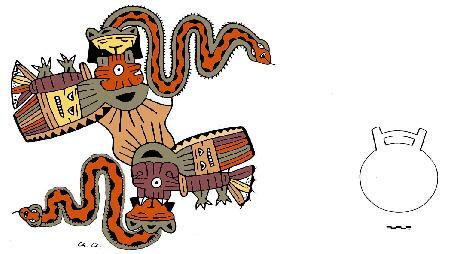 Wing and tail depicted with snake feathers. Wing covered with trophy heads. The main figure holds a club and carries a carrying cord that comes out of the being’s mouth (same gesture as in CL 57). Iconographic Features: Bird Mythical Being 6 (BMB-6) depicted with square head, torso in form of a trophy head, tail and wing. It is depicted with a trophy head in its beak. Attached to the trophy head torso is a trophy head covering the wing. Feathers replaced by snakes. Anatomy looks compressed. Motif appears on mantle of a noble woman.